Homeschooling preschoolers – a new year begins. One more homeschool cupboard has been cleaned out and set up ready for the new year. Our 3 1/2 year old little man has joined the ranks with his older brothers and sisters to do “school” after breakfast each morning. Now I know how important it is at this age to keep school relaxed and enjoyable and not to focus on too much bookwork. Plenty of time for creative, open-ended and active play is an absolute necessity, along with character training as a firm foundation for all other skills. However… there is a place for teaching little boys to sit and concentrate on a task for a good length of time. For some this is more difficult than others but it can be done and dare I say it, must be done. You are doing your sons no favours if you do not teach them the self-control necessary to sit still and achieve a task that is set by someone else. Think ahead to a work or classroom situation – hard as it may be, they need this skill. This training ideally starts early, with sit time in the highchair, mat time while you prepare dinner, playpen time as babies and all the other parent-directed periods that are so vital to a balanced routine. If you have had all these in place since babyhood then starting some kindergarten activities at the table will be a breeze. If not; it’s not too late – start now! Start small and build on it until it is easy for your little one to sit for a while and finish an activity that you set for them to do. I use a workbox system for my younger students and find it works well. It takes a little time to set up but pretty much runs itself once you are going, with change-overs only necessary every couple of weeks as skills are mastered or interest wanes with particular activities over time. We do “school” at home four days a week so there are 4 shelves of 2 boxes per day. The first box holds the “work” that is done with my supervision and the second box holds independent activities that are completed with some choice once the set tasks are done. We have already been working on basic counting skills and our little man is familiar with the alphabet and knows most of the sounds. To build on this, his work for the day will be a Montessori style maths counting tray followed by an initial sounds worksheet involving a little bit of writing practice. These initial sounds worksheets are so quick and simple but give that bookwork feel that my little kids love because it makes them think they are doing real school just like the big kids. They have to review the letter name and sound then say the name of each object slowly to see if it starts with the right sound. They circle the ones that do and cross out the ones that don’t before tracing the large letter in the middle a couple of times in varying colours. Just a little bit of pencil work to practice but nothing too taxing. The fun boxes hold activities that can be done without help but still have educational value. Fine motor skills, problem solving, language development and more are included here on a rotational basis. Monday has magnetic dressing dolls, playdough and letter stamps and our “Day and Night” puzzle that requires the children to match the silhouette or picture in the direction cards. Tuesday has finger puppets, regular cardboard puzzle and lacing beads. The large wooden lacing stick makes it easier for little fingers to put the beads on. Thursday’s workbox has another puzzle, magnetic pictures and magnetic white board and number lacing beads. The Friday box includes a puzzle plus magnetic alphabet letters and and magnetic whiteboard, along with some paper, scissors, glue, texts and Star Wars wrapping paper (saved from the Christmas presents) to create with. Our little man was already asking to have a go at bits and pieces as I was putting these together so that’s a good sign. Keeping school toys out of the general rotation means that these are almost like new and he can’t wait to start. Next up; the 6 year old twin’s cupboards. Year 1 here we come! It constantly amazes me how much we can get through in only 15-30 minutes of focussed time. I really encourage all those overwhelmed homeschool Mothers with multiple children that you only need a small window each day to teach basic reading, writing and arithmetic skills. Montessori style hands-on activities make it enjoyable and interesting for the children and encourage them to be active participants and motivated learners. I have a good stockpile of useful materials collected and organised and in an hour I put together these counting activities for my 3 year olds who have just started doing some tray activities with me on a daily basis. For a more detailed idea of how to introduce these, see here. Natural materials like wood and rocks are very appealing. My older children love these rocks and all wanted a quick go of this tong transfer activity. The jewel beads are numbered 1 to 5 and placed in order around the segmented tray before the correct number of rocks are transferred into each section. These doves and little heart boxes are wedding favours from our local discount store. They are so cute the kids can’t resist playing with them. Half the battle to get children to learn is won when they are interested in what you are presenting to them. Make up a little story to go with it and they will be eating out of your hand. I told mine that the birds have been specially trained by the King and Queen to fly back to their own love heart bed for the night and gave them a couple at a time to count in order to figure out which bed they had to put them into. Taking the lids off to discover what number was inside was a good opening and closing activity in itself and added to the mystery. We also used a number strip to match the lids to as they do not yet recognise the numerals. 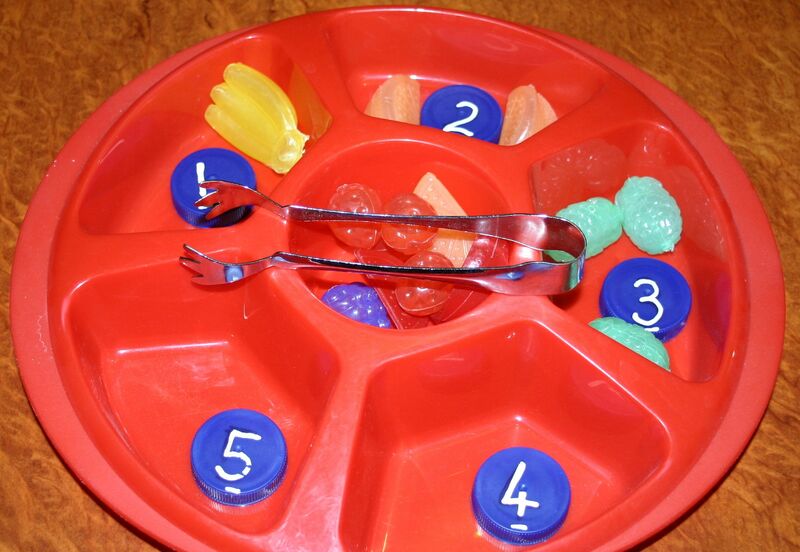 A simple popsicle counting tray. You could colour-code the sticks for beginners to sort by colour first before counting and placing into the correct jar. These colours could also match the sticker on the jar for an added self-checking aspect. These iceblock fruits (the kind that come filled with water for freezing and adding to drinks) have been a hit from day one. They are a lot brighter and more attractive than they look in the photo and combined with some milk bottle lid numbers (liquid papered on) and a chip and dip tray from the local op shop, this took me about 2 minutes to put together. Sparkle pompoms, some gold plastic disposable plates and teabag tongs with baby food jar lid numbers make another easy activity tray. If you make up a funny story about guests at a restaurant who are ordering different amounts of food and tell the children that they (as the chef/waiter) need to deliver exactly what the customer wants, they will be enthralled. My guests got progressively more greedy as the numbers increased and this had the twins giggling along. Somehow my children always find it funny when we pretend play about bad manners! These clips were a mistake right from the start. One side is shorter than the other and they are quite stiff so the children can’t get a good grip to press them open and clip them onto things. I let them have a try but we usually just end up sorting them into the compartments. I’ve kept them because they are bright colours and the kids do find them an attractive material to handle. Six trays in an hour of prep (most of which was getting the stuff out and packing it away when I’d finished) and I am set for a good few weeks. I’m guessing that by the time the interest in these wears off, they will both be able to count to 5 and ready to move on to counting to 10 trays. Or back to initial sounds, or 3 letter words or… whatever takes our fancy next.